Strawberry and Garlic. These are large, spreading trees that cast dense shade. The area beneath sweet chestnuts makes a good summer sitting area. Prepare a large hole by breaking up the soil and adding plenty of well-rotted organic matter. A wide hole is better than a very deep one. Mulch after planting, and encircle the trunk with a wire cage or protective pipe to protect the young tree from animal and insect pests. 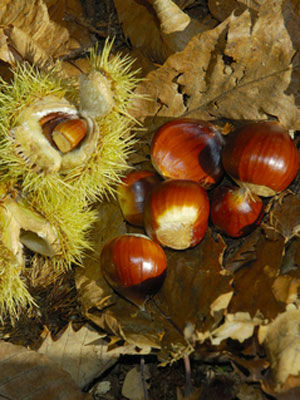 For a large spread, chestnuts can be grown at 65ft (20m) apart. Some varieties are not self-fertile, so more than one will need to be planted for successful pollination. Healthy sweet chestnut trees will bear for decades. When ripe nuts fall from the trees, remove the husks (wearing gloves) and dry. Squirrels, rodents and birds will steal the nuts.